Synbionyme laboratories offer a line of cosmetic care products benefiting from a unique scientific approach to defending the skin and beautifying it. Its skin care philosophy is based on restoring and improving the skin's defense capacities before correcting its problems. With age, emotional stress, and environmental assaults, the skin's defense barriers are altered and become less effective. Changes in these natural lines of defense cause the skin to age prematurely and blemishes to appear. Corneal layer : it makes the skin stronger by promoting synthesis of its major components. 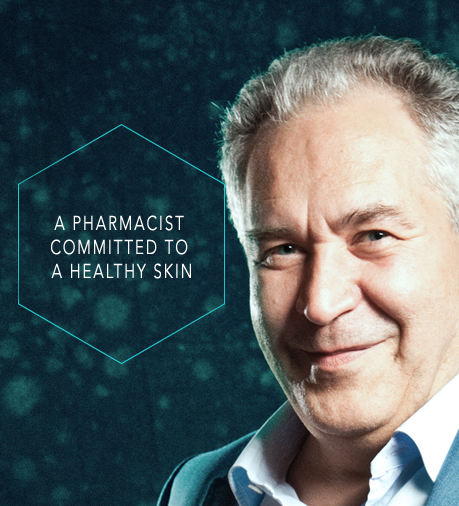 Michel Bohbot is a Doctor of Pharmacy, former intern at Hôpitaux de Paris and a specialist in skin biology. He has devoted his entire professional career to dermatology. After 30 years serving the healthcare industry, including the last 15 years as general manager of major French medical cosmetics brands, he undertook the industrial adventure in 2015 when he founded Synbionyme with a team of scientists. "Because it is useless to try to beautify your skin if its fundamental barrier functions are damaged!" Convinced that the skin’s microbial, metabolic and immune balances are the only guarantee for durably youthful, healthy skin, the Synbionyme research team developed a multi-defense system, Pro-B3. In collaboration with an independent laboratory, it worked for 2 years to demonstrate the exceptional properties of this complex he had anticipated and decided to build a brand to showcase it. Synbionyme was born. Its primary objective: restoring and reinforcing these essential functions of the skin to preserve it and make it more beautiful and more receptive to the care you give it. The concept: restore the skin’s defensive capacities before performing any skin care routines. How does the skin defend itself? Microbial barrier: like the intestine, the skin is naturally covered with microorganisms that live intelligently with our cells, balance our immune defenses, and repel undesired foreign germs. The healthiness of this friendly bacteria guarantees potentially high skin defenses. 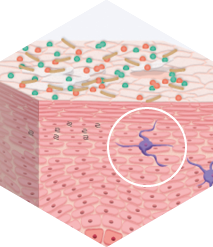 Immune barrier: just like the body, the skin has its own immune defense system and has sentinel cells on the epidermis that are essential to the proper functioning of these defenses. Physical barrier: formed by the corneal layer, its lipids, and underlying tight junctions, it plays a fundamental role in keeping undesirable substances and microorganisms from penetrating the skin. The Synbionyme laboratory offers products with sensorial textures adapted to each skin type and whose efficacy has been scientifically proven. Designed for women who want to better understand their skin and its secrets, Synbionyme products are formulated using the Pro-B3 complex and active agents known for their powerful efficacy. Synbionyme develops daily skin care products, photoprotectors, anti-aging solutions and specific skin care products. Their puropose is to treat the main skin disorders and rebalance its defense barriers. Synbionyme entered the French and international markets in 2017 with a line of 13 products enriched with the Pro-B3 complex and a Universal Serum with high concentrations of Pro-B3. acne care for adult women.